A paper from 1943 unearthed recently in the Canadian national archives reveals that a quack scientist tested children at the Brandon Indian Residential School in Manitoba for psychic abilities. The children were already being used as test subjects in medical "experiments" as well as nutritional ones, which mainly consisted of starving them. 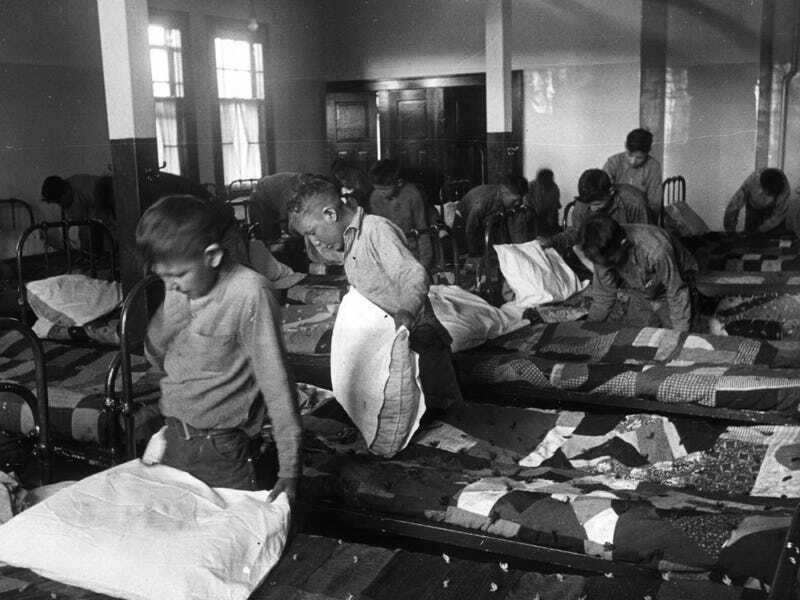 It's been clear for a long time that First Nations children at residential schools in Canada suffered from terrible mistreatment, starvation, and neglect. In the summer of 2013, the Truth and Reconciliation Commission, which as created to uncover all the facts about what happened at the schools and hear testimony from the survivors, reported that the children at the schools were used as medical test subjects in the 1940s and 1950s. Those schools, by the way, were run by churches. The experiments aren't the earliest record of abuse; as far back as 1928, Indian schools in Canada were forcibly sterilizing First Nations girls. And as a 2007 Amnesty International report lays out, severe abuse was widespread at Indian schools in both Canada and the U.S., where children were forbidden to speak their language (to "civilize" them) and used in "experiments" that were sometimes fatal: there is ample evidence and testimony, as Amnesty says, of "beating, poisoning, electric shock, starvation, prolonged exposure to sub-zero cold while naked, and medical experimentation, including the removal of organs and radiation exposure." But as CBC reported earlier this week, a Winnipeg resident named Maeengan Linklater found a passing reference to psychic testing in a book about Manitoba history, and had a librarian friend locate the original paper on the ESP tests. (It's available at the CBC link.) In it, a scientist named A.A. Foster says a teacher at Brandon School, "Miss D. Doyle," tested around 50 children for psychic abilities in 1941. She gave them candy to participate—surely a powerful motivator for possibly starving children—and tested them with a special deck of cards. Foster says that since many of the subjects were "untrustworthy by youth or disposition," the cards were concealed behind a screen and they had to guess what they were. He calls many of the children "primitive," saying life on their reservations had consisted of hunting, fishing and trapping, and that they "had never seen trains or motorcars." Doyle had previously been trained on how the test was to run using a white child. Foster admitted the test was "a failure as far as producing evidence for ESP," but said it might be regarded as "experimental control." He also took it for granted that everybody knew First Nations people were all psychic: "The bare fact that American Indians have shown psychic ability is not surprising enough to deserve great emphasis." Of course. At least 1,500 children were tested in various experiments across British Columbia, Alberta, Ontario and Nova Scotia; more than 15,000 were ultimately taken from their homes. In the 1990s survivors of the schools sued the Canadian government, leading to a $1.9 billion settlement and in 2007 an apology from Prime Minister Stephen Harper.